2016 NCAA Men’s Division I Ice Hockey Tournament – the 2016 Frozen Four: Boston College, Denver, North Dakota, Quinnipiac)./+ All-time NCAA Division I men’s ice hockey Titles list (1948 to 2015), with all-time Frozen Four appearances list (including 2016), by team. By Bill Turianski on 28 March 2016; twitter.com/billsportsmaps. -Tournament, teams, etc… 2016 NCAA Division I Men’s Ice Hockey Tournament (en.wikipedia.org). -2015-16 D-I attendances… Men’s Division I Hockey Attendance: 2015-2016 (uscho.com/stats/attendance). Boston College Eagles, Denver Pioneers, North Dakota Fighting Hawks, Quinnipiac Bobcats. The 2016 Frozen Four will take place on April 7-9 in Tampa, Florida at the Amalie Arena (home of the NHL’s Tampa Bay Lightning), which has a capacity of 19,092 for ice hockey. On April 7th, Boston College will face Quinnipiac, and Denver will face North Dakota. The final will be at 8pm on April 9th and will be shown live on ESPN. 14th-best in NCAA Hockey (in a 7,884-capacity arena: at 63.0 percent-capacity). Path to 2016 Frozen Four – 1R: Boston College 4, Harvard 1. 2R: Boston College 3, Minnesota-Duluth 2. Boston College’s 25th Frozen Four appearance (previously: 2014). AP Photo via nhl.nbcsports.com. Michael Dwyer/AP Photo via accesswdun.com. John Wilcox/bostonherald.com/sports. Boston College men’s hockey uniforms illustrations, by Two Hearted River at File:HE-Uniform-BC.png (en.wikipedia.org). 13th-best in NCAA Hockey (in a 6,026-capacity arena: at 85.0 percent-capacity). Path to 2016 Frozen Four – 1R: Denver 7, Boston University 2. 2R: Denver 6, Ferris State 3. The University of Denver’s 15th Frozen Four appearance (previously: 2005). Denver Pioneers’ facebook.com page/photo album from 3-27-2016. Unattributed at localtvkdvr.files.wordpress.com. University of Denver men’s hockey uniforms illustrations, by Two Hearted River at File:WCHA-Uniform-UD.png (en.wikipedia.org). Best attendance in NCAA Hockey (in a 11,634-capacity arena: at 100.4 percent-capacity). Path to 2016 Frozen Four – 1R: North Dakota 6, Northeastern 2. 2R: North Dakota 5, Michigan 2. The University of North Dakota’s 22nd Frozen Four appearance (previously: 2014 & 2015). Unattributed at salemwebnetwork.com. AP Photo via sctimes.com/sports. Jesse Trelstad/Grand Forks Herald/grandforksherald.com/sports/und-hockey-und-upends-michigan-earn-another-berth-frozen-four. North Dakota hockey jersey illustrations from hockeygiant.com. Illustration, originally posted on facebook.com, of disgruntled North Dakota fans’ lament: “How About We Keep Sioux?”, illustration unattributed at startribune.com/north-dakoka-still-crazy-about-hockey-but-not-new-nickname [Nov.21 2015]. 26th-best in NCAA Hockey (in a 3,086-capacity arena: at 105.2 percent-capacity). Path to 2016 Frozen Four – 1R: Quinnipiac 4, RIT 0. 2R: Quinnipiac 4, UMass-Lowell 1. Quinnipiac University’s 2nd Frozen Four appearance (previously: 2013). Unattributed at tribwtic.files.wordpress.com. Quinnipiacbobcats.com. Quinnipiac University men’s hockey uniforms illustrations, by Two Hearted River at File:ECAC-Uniform-Quinnipiac.png (en.wikipedia.org). All-time NCAA Division I men’s ice hockey Titles list (1948 to 2015), with all-time Frozen Four appearances list (including 2016), by team. Thanks to the contributors at NCAA Division I Men’s Ice Hockey Championship (en.wikipedia.org). Thanks to Chris Creamer’s Sports Logos Page, for some of the logos, at sportslogos.net/leagues/ [College logos]. Australia, National Rugby League: NRL attendance chart for 2015 regular season (with 2015 finishes listed)/+ the North Queensland Cowboys – 2015 NRL champs (their first title) & 2016 World Club Championship winners. -2016 season (teams, etc)… 2016 NRL season (en.wikipedia.org). -Australia’s leading sports opinion site’s rugby league page… theroar.com.au/rugby-league. Australia (and New Zealand): National Rugby League (NRL) – 2015 location-map with a chart which shows…2014 attendances by club, club colours & crests, and titles (Premiers) won by club./ Plus an article on the history of pro Rugby League in Australia./ Plus illustrations for 2 clubs; the highest-drawing rugby club in the world (the Brisbane Broncos) & the reigning RL champions of Australia and the World (the South Sydney Rabbitohs). By Bill Turianski on 25 March 2016; twitter.com/billsportsmaps. Source for 2015 NRL attendance figures: afltables.com/rl/crowds/2015 (AFL Tables site/NRL). 2015 NRL Grand Final, at ANZ Stadium in Sydney, New South Wales. Attendance: 82,758. The first all-Queensland rugby league Grand Final. North Queensland Cowboys 17, Brisbane Broncos 16 (Golden Point). Here is a 4:38 video of highlights of the match…NRL Grand Final 2015 Cowboys vs. Broncos Match Highlights (uploaded by Premier Sports at youtube.com). Aerial view of Townsville, QLD, photo by Tourism and Events Queensland at queensland.com/destination Townsville. Shot of waterfront from hotel balcony in Townsville, photo by Nicole at bittenbythetravelbug.com/what-to-do-in-townsville-australia. View of Townsville at night, photo by Geoff Beck at redbubble.com/townsville-queensland-australia-at-night-capital-of-far-north-queensland-poster. Aerial view of North Queensland cowboys home venue – Willow Sports Centre (aka 13000Smiles Stadium), photo by liney_2000 at panoramio.com. Cowboys & Broncos fans mugging for the camera outside ANZ Stadium prior to the 2015 Grand Final – showing that Queensland pride trumps their teams’ rivalry, photo by AAP Images via dailymail.co.uk. North Queensland fans at Grand Final with Jonathan Thurston banner, photo by AAP Images via dailymail.co.uk. Screenshot of 2015 NRL Grand Final opening kick-off, images from video uploaded by Premier Sports at youtube.com, NRL Grand Final 2015 Cowboys vs. Broncos Match Highlights. Two seconds before the final whistle, North Queensland FE Michael Morgan flicks a short outside pass to RW Kyle Feldt, who scores as time expires to even the score at 16-16, screenshot of image uploaded by Premier Sports at youtube.com, NRL Grand Final 2015 Cowboys vs. Broncos Match Highlights. Morgans crucial offload, photo unattributed at the [Brisbane] Courier Mail, couriermail.com.au/michael-morgans-calmness-key-to-setting-up-kyle-feldt-try-in-nrl-grand-final. North Queensland RW Kyle Feldt scores a try as time expires (80′), but the extra point is missed, sending in the game into extra time, photo by Cameron Spencer/Getty Images AsiaPac via zimbio.com. Jonathan Thurston (top scorer for 2015 Cowboys/2015 Grand Final MVP), about to kick the winning field goal in extra time, photo by Getty Images via dailymail.co.uk. The following day (Monday, 5 October 2015), at the Cowboys’ stadium in Townsville, 15-thousand-strongNorth Queensland fans celebrate their team’s triumph; Co-captains Matthew Scott and Man of the Match-winner Jonathan Thurston (in shades with medal) hold the trophy, photo by Ian Hithcock/Getty Images via stuff.co.nz/Triumphant-NRL-champions-North-Queensland-Cowboys-return-to-Townsville. Illustration of North Queensland Cowboys 2015 season, illustration by leagueunlimited.com at 2015 in review – North Queensland Cowboys. Thanks to the contributors at National Rugby League (en.wikipedia.org). A Big Thanks to afltables.com, for the pretty-hard-to-find 2015 NRL attendance figures. Australia, Australian Football League: AFL attendance chart for 2015 regular season (with 2015 finishes listed)/+ the Hawthorn Hawks – 2015 AFL Premiers [champions] (their 3rd-straight title, and 13th overall). By Bill Turianski on 21 March 2016; twitter.com/billsportsmaps. -2016 AFL teams previews… by Russell Jackson at Guardian/sport…theguardian.com/profile/russell-jackson. -2016 season (teams, etc)… 2016 AFL season (en.wikipedia.org). -2015 attendance figures… afltables.com/afl/crowds/2015 (AFL Tables site). Australian rules football – the Australian Football League (AFL), 2015 location-map with: rules (in general), clubs-history-chart, and chart of 2014 attendances with titles listed./ Plus: 2014 champions the Hawthorn Hawks. 2015 AFL attendance figures from AFL Tables.com, at afltables.com/afl/crowds/2015.html. AFL teams’ jersey-pattern icons from en.wikipedia.org/wiki/Australian_Football_League#Current_clubs. From Guardian/sport, from 3 Oct. 2015, by Russell Jackson, AFL grand final: Hawthorn defeat West Coast Eagles by 46 points – as it happened (theguardian.com/sport/blog). Hawthorn Hawks – 2015 AFL Premiers [champions] (their third-straight title). Hawthorn Hawks 16.11 (107), West Coast Eagles 8.13 (61). Photo credits above – Aerial shot of Melbourne Cricket ground [photo circa 2014], home of the AFL Grand Final, photo unattributed at piecesofvictoria.com. Photo of Hawthorn’s giant banner which was displayed prior to the match; photo from File:2015 AFL Grand Final Hawthorn banner.JPG, photo by Jenks24 at commons.wikimedia.org. Cyril Rioli leaps for a mark, photo by Julian Smith/AAP via theguardian.com/sport. Cyril Rioli scores his second first-quarter goal, photo by Julian Smith/AAP via abc.net.au/cyril-rioli-keeps-up-family-tradition-with-norm-smith-medal-win. 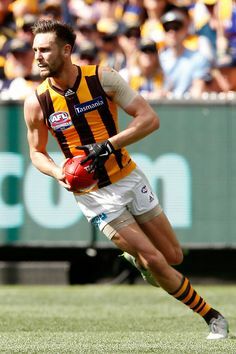 Jack Gunston, photo unattributed at pinterest.com. Isaac Smith being tackled (but not without a fight), photo by Quinn Rooney/Getty Images AsiaPac via zimbio.com. Shaun Burgoyne and Cyril Rioli of the Hawks celebrate with fans as trophy gets passed towards them, photo by Darrian Traynor/AFL Media/Getty Images AsiaPac via zimbio.com. Cyrile Rioli with winners medal and Neal Smith medal (man of the match), photo unattributed at tlaworldwide.com/jpg. Thanks to the contributors at Australian Football League (en.wikipedia.org). Thanks to Russell Jackson for the live-blog article at The Guardian/sport/blog. A Big Thanks to afltables.com, for attendance figures. 2016 NCAA Men’s Division I Basketball Tournament – the 68 teams – map, with team locations / Plus 2015 average attendances listed. -Teams, etc…2016 NCAA Men’s Division I Basketball Tournament. -Scores…Div I college bk scores (espn.go.com). By Bill Turianski on 13 March 2016; twitter.com/billsportsmaps. Arizona Wildcats. Pac-12. Tucson, AZ. Arkansas-Little Rock Trojans. Sun Belt. Little Rock, AR. Austin Peay Governors. Ohio Valley. Clarksville, TN. Baylor Bears. Big 12. Waco, TX. Buffalo Bulls. Mid-American. Buffalo, NY. Butler Bulldogs. Big East. Indianapolis, IN. California Golden Bears. Pac-12. Berkeley, CA. Cal State-Bakersfield Roadrunners. WAC. Bakersfield, CA. Chattanooga Mocs. Southern. Chattanooga, TN. Cincinnati Bearcats. American Athletic. Cincinnati, OH. Colorado Buffaloes. Pac-12. Boulder, CO.
Connecticut Huskies. American. Storrs, CT / Hartford, CT.
Dayton Flyers. Atlantic 10. Dayton, OH. Duke Blue Devils. ACC. Durham, NC. Fairleigh Dickinson Knights. Northeast. Hackensack, NJ. Florida Gulf Coast Eagles. Atlantic Sun. Fort Myers, FL. Fresno State Bulldogs. Mountain West. Fresno, CA. Green Bay Phoenix. Horizon. Green Bay, WI. Gonzaga Bulldogs. West Coast. Spokane, WA. Hampton Pirates. Mid-Eastern. Hampton, VA.
Hawaii Rainbow Warriors. Big West. Honolulu, HI. Holy Cross Crusaders. Patriot. Worcester, MA. Indiana Hoosiers. Big Ten. Bloomington, IN. Iona Gaels. Metro Atlantic. New Rochelle, NY. Iowa Hawkeyes. Big Ten. Iowa City, IA. Iowa State Cyclones. Big 12. Ames, IA. Kansas Jayhawks. Big 12. Lawrence, KS. Kentucky Wildcats. SEC. Lexington, KY.
Maryland Terrapins. ACC. College Park, MD. Miami Hurricanes. ACC. Coral Gables, FL. Middle Tennessee Blue Raiders. Conference-USA. Murfreesboro, TN. Michigan Wolverines. Big 10. Ann Arbor, MI. Michigan State Spartans. Big 10. East Lansing, MI. North Carolina Tar Heels. ACC. Chapel Hill, NC. Notre Dame Fighting Irish. ACC. Notre Dame, IN. Oklahoma Sooners, Big 12, Norman, OK.
Oregon Ducks. Pac-12. Eugene, OR. Oregon State Beavers. Pac-12. Corvallis, OR. Pittsburgh Panthers. ACC. Pittsburgh, PA.
Providence Friars. Big East. Providence, RI. Purdue Boilermakers. Big 10. West Lafayette, IN. Saint Joseph’s Hawks, Atlantic 10. Philadelphia, PA.
Seton Hall Pirates. Big East. Newark, NJ (campus: South Orange, NJ). South Dakota State Jackrabbits. Summit. Brookings, SD. Southern University Jaguars. Southwestern. Baton Rouge, LA. Stephen F. Austin Lumberjacks. Southland. Nacogdoches, TX. Stony Brook Seawolves. America East. Stony Brook, Long Island, NY. Syracuse Orange, ACC. Syracuse, NY. Temple Owls. American. Philadelphia, PA.
Texas Longhorns. Big 12. Austin, TX. Texas A&M Aggies. Big 12. College Station, TX. Texas Tech Red Raiders. Big 12. Lubbock, TX. Tulsa Golden Hurricanes. American. Tulsa, OK.
UNC-Asheville Bulldogs. Big South. Asheville, NC. UNC-Wilmington Seahawks. Colonial Athletic. Wilmington, NC. University of Northern Iowa Panthers. Missouri Valley. Cedar Falls, IA. University of Southern California Trojans. Pac-12. Los Angeles, CA. Utah Utes. Pac-12. Salt Lake City, UT. Vanderbilt Commodores. SEC. Nashville, TN. Villanova Wildcats. Big East. Villanova, PA / Philadelphia, PA.
Virginia Cavaliers. ACC. ACC. Charlottesville, VA.
Virginia Commonwealth University Rams. Atlantic 10. Richmond, VA.
Weber State Wildcats. Big Sky. Ogden, UT. West Virginia Mountaineers. Big 12. Morgantown, WV. Wichita State Shockers. Missouri Valley. Wichita, KS. Wisconsin Badgers. Big Ten. Madison, WI. Xavier Musketeers. Big East. Cincinnati, OH. Yale Bulldogs. Ivy League. New Haven, CT. Thanks to Lokal_Profil for blank map, File:Blank USA, w territories.svg (commons.wikimedia.org). Thanks to the contributors to the pages at en.wikipedia.org, ‘2016 NCAA Men’s Division I Basketball Tournament’. Thanks to NCAA for attendance figures, from ncaa.com/mbb_attendance.pdf.